Cancelled events and future plans! 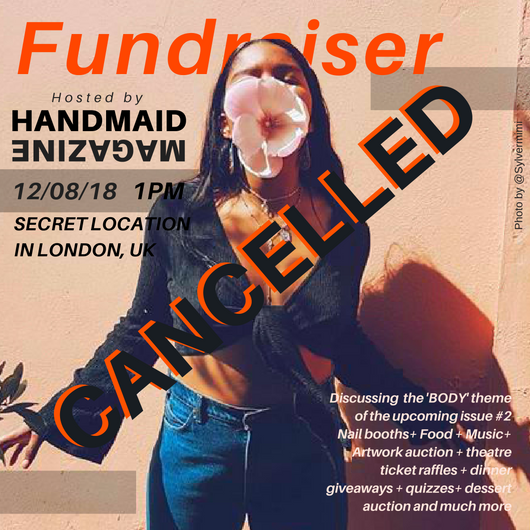 As some of you have already heard, we had to cancel the fundraiser event that we were planning to host in August due to… well, things not coming together. Let’s just say I want every Handmaid event to be an experience. I was so excited for this gathering because the plan was to make some money to fund our upcoming magazine but also to give you a really amazing, and I mean super amazing experience. But not to worry I am planning to plan an event this year! but there will most definitely be more events in 2019. The magazine release is also being postponed to January, it will be worth the wait! If you know anyone with a space to host an event please drop me an email or DM me on instagram or facebook. And if you feel like you have gifts in the area of planning, promotions, decorating ect then gurl let me know! Handmaid needs you! What would you like to see in the next Handmaid gathering? Leave your suggestions below. And like always we need you continued prayers and support.